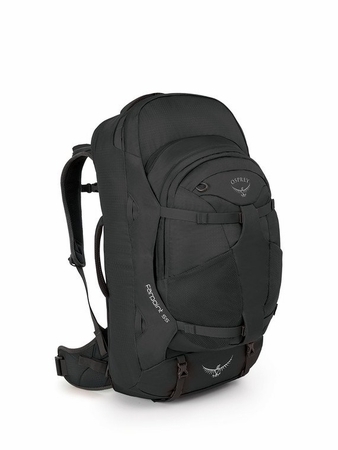 "Osprey�s Farpoint 55 is the perfect companion for a long weekend. Feel free to add an extra sweater and a pair of waterproof boots; this pack is designed to handle loads up to 50 pounds. COMFORTABLE FIT- Whether traveling near or far, a comfortable pack means one less headache. We use decades of experience to ensure a comfortable, gender-specific fit for every adventure. STOWAWAY HARNESS AND HIPBELT -The Farpoint & Fairview harness stows away for safe keeping and protection from malicious baggage handlers and deploys quickly for any path or trail. LIGHTWEIGHT AND TOUGH- Durable fabrics in high-wear areas combine with smart design to create a lightweight and tough travel pack that will last a lifetime. S/M - 3173 in3 / 52 l -24h x 13w x 12d in. - 3.75 lbs. M/L- 3356 in3 / 55 l - 25h x 13w x 12d in. - 3.9 lbs."